Ropnoy’s TATTOO enables organisations to track the use of Static Data and externally provided Reference Data files across their domains. Invariably, streaming data like real-time will have dedicated ‘permission’ systems as part of the overall configuration, but Reference data in the form of static files in CSV or Excel format, once downloaded from a secure website or FTP site, cannot be traced and can reside on an internal share which any number of users can access. Data files are tagged at source with an indelible checkmark generated from the files’ digital fingerprint. This checkmark is recorded on the Registration server with the file details and origination. Tattoo doesn’t alter files in any way, so implementing the system is seamless and it can be applied in an iterative way without impacting the business workflow or requiring any re-engineering of existing systems. Check authenticity, verify usage, and identify duplicates. 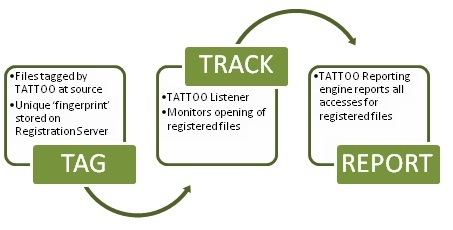 Our Tattoo listener is installed on the network to identify files that are accessed that have the same TATTOO checkmark as the registered files. Using non invasive and unobtrusive low level message calls the Tattoo system will record every time a tagged data file is opened, identifying the real use of the data. Because Tattoo is agnostic, it works with any kind of Data file including Application executables, making it universally adaptable and applicable. Tattoo will record the use of licensed software and provides a reporting facility to identify utilisation and frequency. The non-intrusive nature of Tattoo means that the data can be assimilated without an extensive ‘agent deployment’ resulting in a much faster implementation with no business or user disruption. This single toolset will provide not only a software metering capability, but also the ability to track any data file that is accessed on the corporate domain. This will include licensed Vendor and Exchange Data, End of day Reference Data or Static Data files. Tattoo can identify duplicate files even when they have been renamed, and can radically reduce disk space requirements and remediation during migrations. So, if you’re serious about the need to track data and application usage and want a simple, elegant solution that can be implemented swiftly, talk to Ropnoy.